President Donald Trump's personal attorney used his Trump Organization email while arranging to transfer money into an account at a Manhattan bank before he wired $130,000 to adult film star Stormy Daniels to buy her silence. The lawyer, Michael Cohen, also regularly used the same email account during 2016 negotiations with the actress — whose legal name is Stephanie Clifford — before she signed a nondisclosure agreement, a source familiar with the discussions told NBC News. And Clifford's attorney at the time addressed correspondence to Cohen in his capacity at the Trump Organization and as "Special Counsel to Donald J. Trump," the source said. Cohen has tried to put distance between the president and the payout, which has been the subject of campaign finance complaints. In a statement last month, Cohen said he used his "personal funds to facilitate a payment" to Clifford, who says she had an intimate relationship with Trump a decade ago. "Neither the Trump Organization nor the Trump campaign was a party to the transaction with Ms. Clifford, and neither reimbursed me for the payment, either directly or indirectly," Cohen said in that statement. But an email uncovered in the last 24 hours and provided to NBC News by Clifford's current attorney, Michael Avenatti, shows First Republic Bank and Cohen communicated about the money using his Trump company email address, not his personal gmail account. "I think this document seriously calls into question the prior representation of Mr. Cohen and the White House relating to the source of the monies paid to Ms. Clifford in an effort to silence her," said Avenatti, who is representing Clifford in a lawsuit against Trump. The email, dated Oct. 26, 2017, was sent to Cohen by an assistant to First Republic Bank senior managing director Gary Farro. The email appears to have been a reply to Cohen; the subject was "RE: First Republic Bank Transfer" and the message confirmed that "the funds have been deposited into your checking account." The email did not provide any more details about the accounts the money was transferred from or into and it was not clear whether or not they were personal accounts or corporate accounts. It also did not specify the amount. The next day, Cohen wired money from First Republic to the City National Bank account of lawyer Keith Davidson, who was representing Clifford at the time. "The $130,000 question, however, is from whose account was the money transferred on Oct. 26, 2017." Avenatti said. He said the email "suggests" it might have been a Trump Organization account since the correspondence was through Cohen's Trump email. He said it was "curious" that after he got the email, he immediately forwarded it to his personal gmail and then used gmail to forward it to Davidson, presumably to show the money was ready to be wired. "Mr. Cohen should immediately provide the prior emails [between him and the bank] to show exactly where the money came from," Avenatti said. Cohen and Davidson did not respond to requests for comment from NBC News. First Republic Bank declined to comment. Avenatti is representing Clifford in the lawsuit she filed this week, which alleged the nondisclosure agreement she signed days before the election is void because Trump never actually signed it. In court documents, Clifford says she and Trump, then married to a pregnant Melania, had an "intimate relationship" that lasted from the summer of 2006 "well into the year 2007" — which Trump's representatives have repeatedly denied. Clifford gave an interview about rendezvous with Trump to In Touch magazine in 2011 but it wasn't published at the time. Former employees of the magazine have told the Associated Press it was held after Cohen threatened legal action. Fast forward a decade to 2016, when Trump was a candidate for the White House battling allegations of sexual misconduct. Clifford, according to her lawsuit, began making moves to tell her story to the media. Negotiations between Cohen and Clifford ensued. With the election looming, Cohen registered a company called Essential Consultants in Delaware that could be used for the payment. When he wired the $130,000 to Clifford's lawyer, something about the transaction led First Republic to file a suspicious activity report with the Treasury Department, the Wall Street Journal has reported. The timing of the report or the reason for it are not clear. A year later, City National Bank's interest in the transaction was also piqued. Officials asked Clifford's then-attorney for information about the source of the money, without revealing why they wanted to know, the Washington Post has reported. In January, news of the payment broke, putting Clifford in the spotlight. Now, Avenatti said, she wants to tell her story. "She believes it's important that the public learn the truth about what happened," he told TODAY this week. "I think it's time for her to tell her story and for the public to decide who is telling the truth." 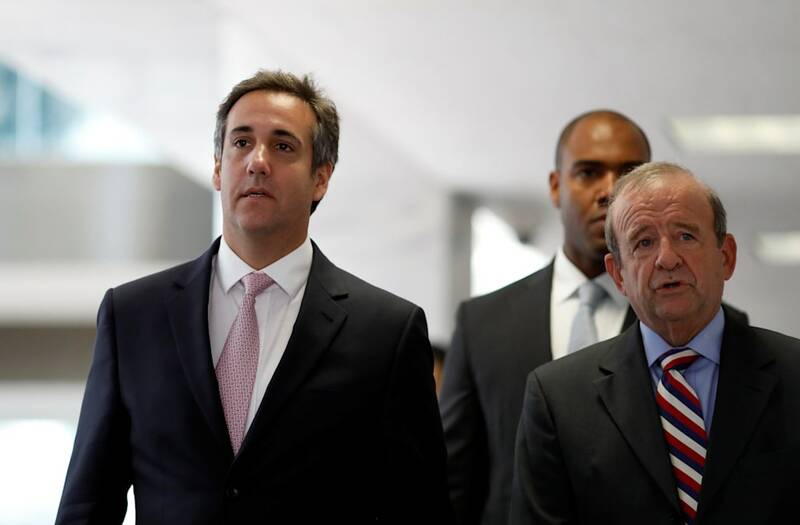 As NBC News first reported, late last month Cohen seized on a clause in the nondisclosure agreement and got a private arbitrator to issue a secret restraining order barring Clifford from publicly releasing "confidential information" about the agreement. The agreement uses pseudonym, referring to Clifford as Peggy Peterson and another individual as David Dennison. In one of the documents, the true identity of Dennison is blacked out, but Avenatti told NBC News the individual is Trump. Clifford signed both the agreement and a side letter agreement using her professional name on Oct. 28, 2016. Cohen signed the document the same day, but blank spaces where "DD" was supposed to sign are empty. That means the agreement is invalid and Clifford is free to talk, Avenatti contends. Her lawsuit asks a court to affirm their position. A day after the lawsuit was filed Cohen hit back. His attorney, Lawrence Rosen, fired off an email warning Clifford that she had violated the 2016 agreement and would be subject to penalties and damages if she continued to disclose information about it. "The designated judge from the arbitration tribunal found that Ms. Clifford had violated the agreement and enjoined her from, among other things, filing this lawsuit," Rosen said in a statement to media outlets. But Avenatti said that because the 2016 agreement was never signed and never in force, the arbitration clause it contains is also invalid and the gag order is meaningless. "We do not take kindly to these threats, nor we will be intimidated," he told NBC News. The suit also says that Trump must know that Cohen is trying to silence Clifford, since rules for the New York bar, of which Cohen is a member, require him to keep his client informed at all times. "[I]t strains credulity to conclude that Mr. Cohen is acting on his own accord and without the express approval and knowledge of his client Mr. Trump," the suit says.